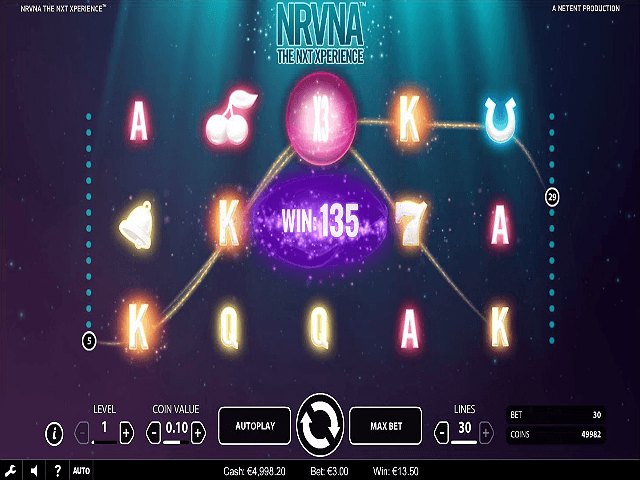 The latest in ultra-modern slot game design, NRVNA: The Nxt Xperience online slot features five reels and 30 paylines of glowing icons set against a calming, colour-changing backdrop. NRVNA software provider NetEnt has strived to create a game that brings some serenity to your day. Futuristic and almost spiritual, it takes spinning the reels to an otherworldly level. Check out our NRVNA: The Nxt Xperience slot review to find out if this game can bring some feng shui to your gaming repertoire. Play NRVNA: The Nxt Xperience for Real Money! NRVNA: The Nxt Xperience immediately calms the mind with blank space between the symbols. The striking icons have a glow surrounding them, with winning paylines linked together by tendrils of euphoric energy. The soundtrack perfectly matches the transient theme of the slot, with chillout music playing throughout the game. In addition, NetEnt has created something truly original in terms of how the game looks, while retaining enough familiarity to not alienate players. It uses many classic slot symbols, as well as offering a lot of bonuses and multipliers. 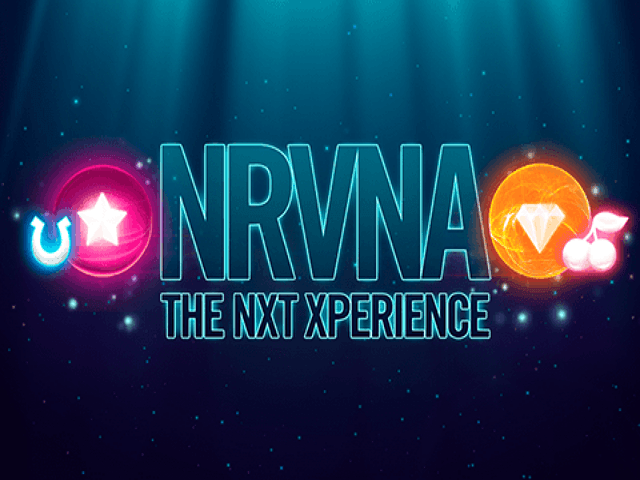 If you're looking for a game to ascend to, NRVNA: The Nxt Xperience also offers a high return-to-player of 96.6%. 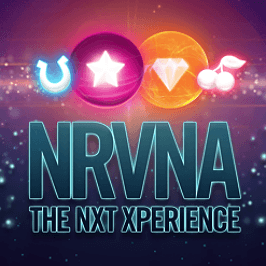 NRVNA: The Nxt Xperience offers a classic slot fused with soothing sounds and symbols on a serene backdrop. It uses standard slot game symbols like 10, J, Q, K, A, as well as throwbacks to fruit machine icons such as a four-leaf clover, bells, the lucky 7, a horseshoe and a pair of cherries. The letters are lower paying than the other symbols, ranging from 70 times the bet for a full payline of 10s, to 125 times the wager for a row of As. The fruit machine icons pay out more. The horseshoe’s maximum payout is 150 times the bet, while the lucky four-leaf clover could net you 200 times the bet for a full row. The bell offers 500 times the wager, while lucky 7s pay out 1000 times the bet for a full payline. The top prize is awarded for five pairs of cherries on one payline, which pays out 2000 times the initial bet. 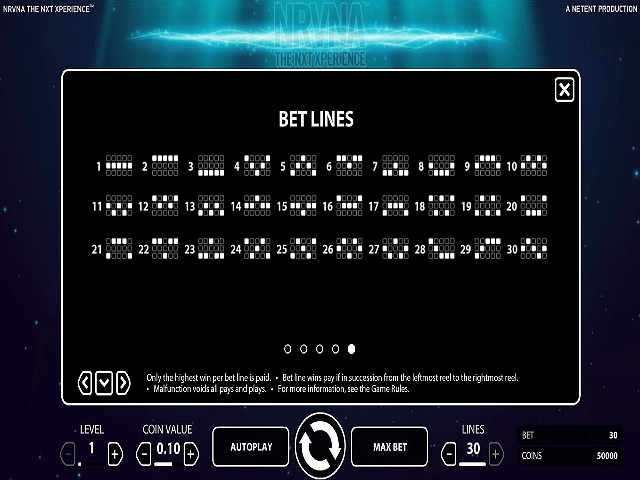 Despite the new-age aesthetics, NRVNA: The Nxt Xperience is crammed with exciting up-to-date slot game features. A shining star is the Wild symbol and this can be substituted for all other symbols except the Scatter. The Wilds also act as multipliers and any winning payline with a Wild symbol in the mix immediately pays three times the prize. The diamond scatter symbol activates the free spins bonus if three or more are found. Uncovering three Scatter symbols awards ten free spins, while four Scatters give you 15 free spins. You can win up to a maximum of 30 free spins for landing five of these icons. Even better, more free spins can be won during the free spins mode. 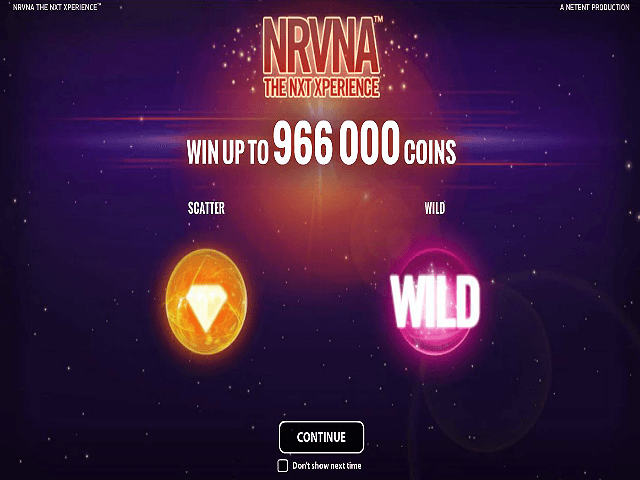 During the free spins game, the radiant NRVNA Wheel randomly appears, gifting you with more free spins, a multiplier up to ten times the wager, or both. Multipliers can be used in conjunction with Wilds to multiply all bet line wins, meaning a Wild’s multiplier value could go from three to 30. Clear your mind and fill your bankroll with NetEnt's new age slot. Share this NRVNA: The Nxt Xperience Review today! If you like NRVNA: The Nxt Xperience, you'll love these slot titles too!